Another installment of the best-selling FPS series, and at the same time a direct continuation to Wolfenstein: The New Order created by Machine Games. The Action of Wolfenstein: The New Colossus is set in 1961 – after waking up from a coma B.J. Wolfenstein II: The New Colossus is another installment of the best-selling FPP shooter series, created by Machine Games. 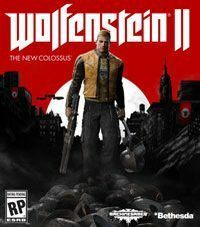 The game is available on a number of platforms including PC, PS4 and etc..
Wolfenstein II: The New Colossus continues the story from the previous installment. In 1961, B.J. Blazkowicz wakes up from the coma and, along with his friends, lands in the Nazi-occupied United States of America. Because of the terror that the Germans (led by Frau Engel) spread across America, the main protagonist is left with no other choice but to yet again take up arms and face the aggressor. Fortunately, Blazkowicz and his companions are not alone in this fight – they are being helped by Horton and Grace, leaders of the local resistance. Interestingly, like the previous installment of the Wolfenstein series, The New Colossus presents an alternative version of history, where the Nazis were able to design Wunderwaffe – an incredible weapon that allowed the Third Reich to win the World War II. The gameplay featured by the PC, PS4 and etc. release of Wolfenstein II: The New Colossus builds upon almost identical mechanics as those offered by its predecessor. Yet again, the foundations of the game lie in the exploration of vast locations (players get to visit e.g. Roswell, New Mexico, and New Orleans), completing a number of mission objectives and eliminating battalions of diverse enemies. On our adventure, we have to face both infantry troops and heavily armed retrofuturistic robots. The main protagonist does not enter the battlefield unarmed – in combat, he utilizes his very elaborate arsenal. Among the available murderous weapons, one can find not only classic firearms (such as pistols and machine guns) but also more fancy pieces like Laserkraftwerk (a laser beam gun that disintegrates the enemies) or Dieselkraftwerk (gas powered grenade launcher, able to eliminate an entire group of adversaries). What is worth mentioning, nothing stops the players from using 2 weapons simultaneously, provided that they have enough ammo. What is also worth mentioning, the developers once again decided to abandon the health regeneration mechanics in favor of the old-school med kit system. Wolfenstein II: The New Colossus offers a high-quality 3D graphics, which make perfect use of the id Tech 6 engine’s technology. When compared to its predecessor, Wolfenstein II: The New Colossus features significant enhancements of textures and special effects that accompany players during the gunfights. The guide to Wolfenstein II: The New Colossus comprises a comprehensive walkthrough of all the missions of the game and location of all hidden secrets and treasures. Fast-paced, brutal action, awesome plot and, most of all, heaps of fun and playability – despite being a rather conservative sequel, Wolfenstein II: The New Colossus will be a notable competitor in 2017’s race for the shooter of the year.